This year, 2019, will mark the 300th Anniversary of the founding of Nutfield. This grant of land came through the Wheelwright deed for a ten square mile parcel that he had acquired from the Indians. 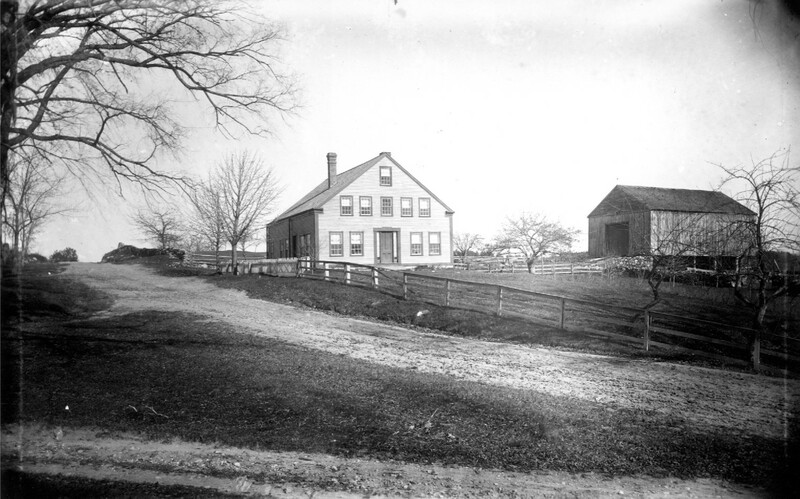 Nutfield consisted of the towns of Windham, Derry, Londonderry and parts of Manchester and Salem. Beginning below is the historical address by the Rev. J.G. MacMurphy at the Nutfield Celebration of 1919. This is a cautionary tale about the meaning of life, how we’re impacted by choices, and how the various multiverses of which we can chose often bring us to unexpected places. Sometimes the most logical, prudent choice is the absolutely worst choice…then again, is it? Is there any bad choice? 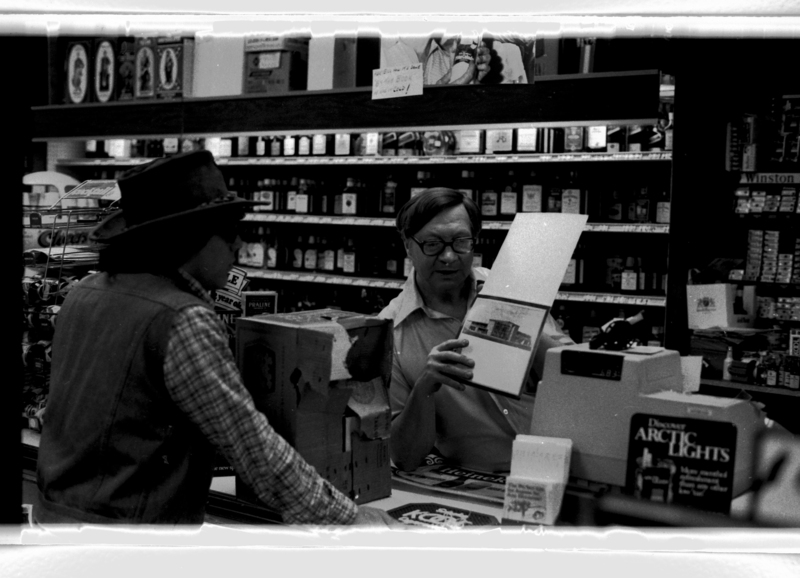 Its been forty years since I embarked on the magical, mystical, redneck express, and found myself facing the most surreal experience of my life. I never felt more alive or afraid of dying. This is also a tribute of sorts to the Ford Mustang, 10 million strong, that saved our lives, even if it was only a crappy Mustang II. You see, I have become convinced that the One, God, the Tao, is an utterly still, void, through which we all live, breath, move and have our being. Within the One are trillions of choices, made on the neutral ground of Being, where we are free, to follow our path. It has to be this way, or there is no choice, or freedom, or the ability to to self-empty in the cause of of others, to sacrifice ourselves out of love. Logic and rules, are the realm of the Angel of Light, where dwells blackness and death. Look at the world where self righteous, authoritarian nations with the most laws, the most restrictions on human freedom and speech, are the most evil and lead over and over again to genocide. Christ could die, commit a selfless act of love, against rationality, logic and order, because of the freedom of the Way. Rules bind, God frees. In order for the universe to exist, with multiple choices, God, the One, has to self-empty, abandon his|her power, and become the neutral ground upon which everything exists. (And for all you physics aficionados, he has to be seen or he doesn’t exist, thus the need for the Son, or the Word, the dual, visualizing nature of the Godhead) So doubters, you can’t “blame” God, because he is free-flowing and totally out of control. I’m sure this is quite the opposite of what you have believed, but I’m here to announce that the God is not sitting on a throne; the One surrounds you and you are within! Be still and think on that for awhile. Then ask yourself a question; which “truth” feels more authentic? Well, sorry, that’s way to deep for this tale and likely to end up in a nasty cul-de-sac. 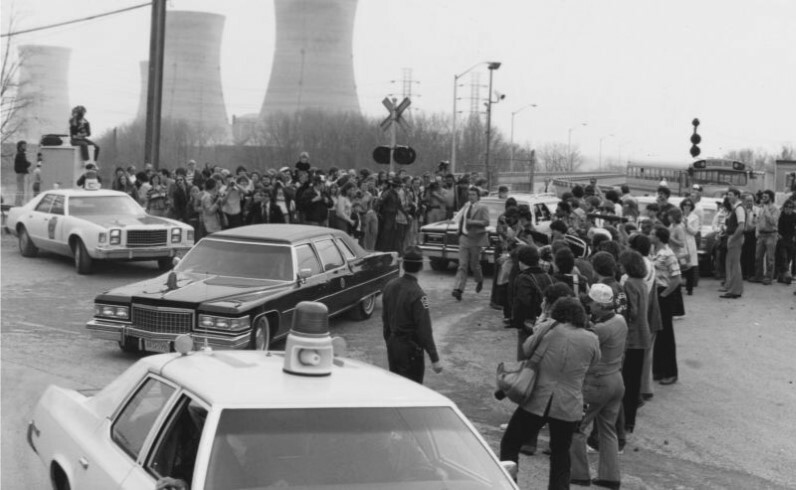 At 4:00 A.M. on March 28, 1979, the Unit 2 reactor at Three Mile Island, near Middletown, PA., partially melted down. The China Syndrome premiered at the 1979 Cannes Film Festival and was released theatrically on March 16, 1979. This has always seemed odd to me, that a movie about a nuclear meltdown would be released just two weeks before the real event in Pennsylvania. False Flag anyone, “cui bono,” who benefits? The Oil Lobby and the Saudis no doubt, as no new nuclear plants would be built after. I was a student at Dickinson College at the time, located just 30 miles away. Everybody was freaking out because America had no experience with nuclear core meltdowns and we were all sure we were going to die. Especially after China Syndrome. The suspense went on for days, typically with no real answers forthcoming from the experts. Remember all, Jimmy Carter was in charge! My parents consulted with the maestro himself, the keeper of all things, John Sununu, and they were given the word that we should scram. Two of my fraternity brothers, Quasimodo Gandolfo and George Salvaggio to be exact, decided the right move would be to get in my Mustang II and head west away from the nuclear reactor. With no planning or forethought, we headed out to a campground in West Virginia, that somebody had stayed in previously as a kid. I don’t even know if we packed gear, then again it didn’t matter because we wouldn’t need it. 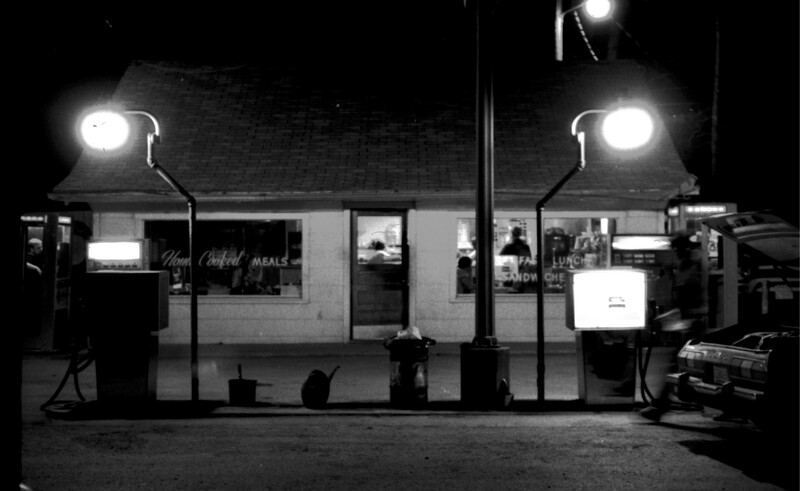 The long drive was a strange trip indeed, with lots of fuel stops at bars and liquor stores along the way. 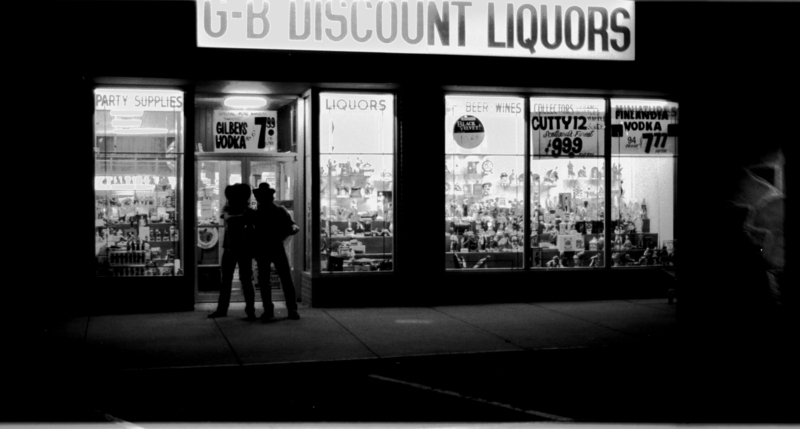 At one liquor store the owner told about his elaborate plans to construct buildings of the future with biomass walls…you remember the seventies with the energy shock. In our haze, we found his ideas amazing! Well back to the story. As we pulled into the town where the camp ground was located, somewhere in the mountains of West Virginia, there was an ominous breeze moving through the trees, making the music that you would swear was the sound of dueling banjos. But that movie hadn’t come out and we were too ignorant to know what that meant and too wasted to care. We stopped to use a pay phone in front of the local bar. 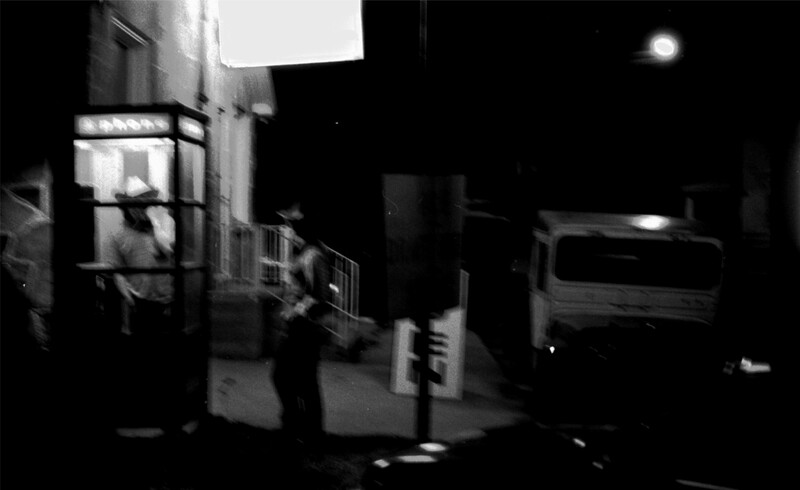 (You remember pay phones, right, you put a coin in them and you could make a phone call.) We wanted to call our parents to tell them we were safe. Clueless and not functioning with the highest mental capacity, we ambled out of the beautiful little Mustang with smoke wafting behind us as we opened the doors. For some reason the pay phone stood right in front of the big plate glass window in the bar. So here we were the freak show for the local rednecks. We could see all the fine folks inside the bar and after we made calls we headed back to the Mustang. Just as we got to the car, all of these young, unkempt, “white privileged” folks, my own kith and kin if the truth be told, were at the door cat-calling after us. Now what was the sensible thing for us to do? You’re right, we didn’t do it! My “brother in the bond,” George Salvaggio, using his best judgement and mental reasoning, (it must have been that Phi Delta Theta cool-aid,) decided to flip them off and call them a bunch of f____ing rednecks. Not a good idea at all. You do remember the multiverse conversation we had at the beginning of this story, well this is where bad choices carried us all into a very unexpected place. We jumped into that crappy little pony and took off, feeling safe that we were on the road again. It never occurred to us that they would follow us, after all, why would they? YOU MEAN BECAUSE THEY WERE BORED AND DRUNK. WHAT ELSE IS THERE TO DO IN THE HOLLERS OF WEST VIRGINIA. ESPECIALLY WHEN FOOLS DROP OUT OF THE HEAVENS WITH NEW HAMPSHIRE LICENSE PLATES IN FRONT OF THE LOCAL BAR. DO YOU THINK IT WAS BECAUSE WE HAD INSULTED THEIR HONOR BY FLIPPING THEM OFF AND CALLING THEM REDNECKS! No, it was a jolting shock to us fools as headlights quickly pulled up behind us. There really was only one choice. We had to get off the back roads and out of the hollows, outrun them, and reach Dwight D. Eisenhower’s beautiful interstate highway system, the promise of the twentieth century, on the other side of town. We did a short, quick, U-turn, and headed back by the way we had come. The rest of this ride is a blur, not because I can’t remember it, but because it took place at 70, 80, 90 and 100+ miles an hour on twisting turning back roads. God that Mustang was good to me! The fact is, I will never forget that ride and the constant dread as headlights shone in the rear view mirror, following close behind. At points in the drive we were side by side, at other points we were driving on the wrong side of the road in order to pass other cars. We could see that the car was packed with people. Now before you critique my driving, you tell me what other choice I had. Should I have stopped and tried to reason with them? We both came roaring back through the center of town, and all of the patrons of the bar we had so merrily stopped at, stuck their heads out the door to see what the hell was going on. I have to admit, whoever was at the wheel of that other car, the yin to our yang, knew how to drive! And good for them, we held each other in an embrace of adrenaline and fear as we headed on through that incredible redneck multiverse. The worst part of this ride was when the rifle barrel made its appearance out of the side window of our pursuers car. It sure appeared as if they planned to shoot at us or simply just shoot us. Or maybe they were just trying to get us to stop so we could be friends. About a mile from the Interstate the road widened and we were driving side by side, when I lost control of the wheel and my beloved Mustang did a 360, stalled, and came to an abrupt stop on the side of the road. At least we hadn’t flipped it over! As the dust cleared, we could see the car behind us, and all of the occupants clamoring out to get us. I often wonder what they would have done to us. It couldn’t have been good. To many insults, to much racing, to many intoxicants for a positive outcome. Well, the mystical Blue Light of the Egyptian Book of the Dead, Angels, Demons, Mother’s prayers, and even maybe the Virgin Mary, must have been invoked at this point because that beautiful “Stang” came roaring back to life with just one turn of the key. All praise be to the glorious Ford Motor Company! Because the “Necks” had left their car, this gave us the opportunity to get a huge head start and we hit the exit ramp of the Interstate with nobody behind us. The chase ended, we had prevailed. We headed back north and stopped in Cumberland, Maryland. 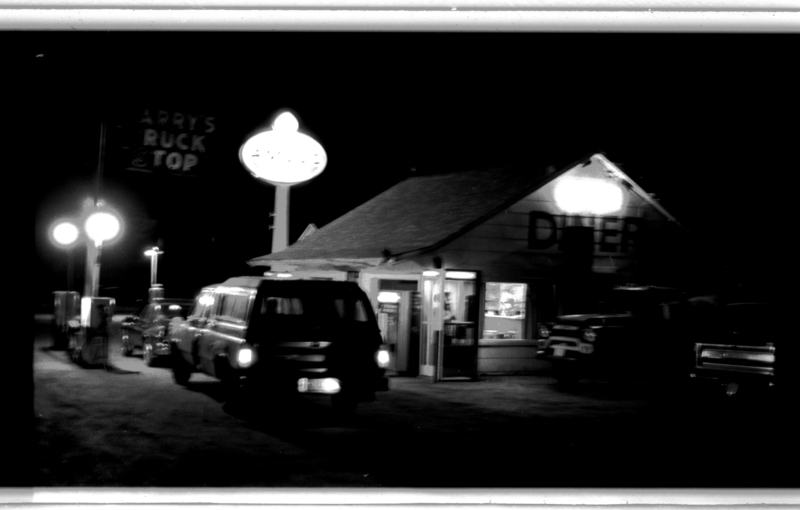 The glowing lights and mid-century architecture of the Holiday Inn or Ramada beckoned us like a warm embrace. Unfortunately, my friends and I couldn’t come up with the fifty bucks for a room. 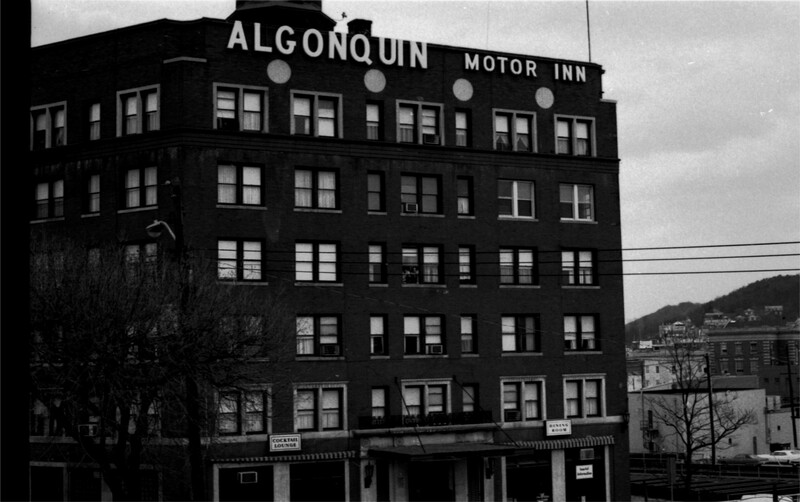 The nice lady behind the check-in desk, who must have found us a bewildering sight, directed us to the local fleabag, the Algonquin Hotel. It didn’t cost more than twenty bucks, and we probably could have rented the room by the hour, but it was a safe, warm, palace to us! The next morning life returned to normal and I dropped my friends of at their homes outside of Pittsburgh and in south Jersey before heading back to New Hampshire. Dickinson College closed for the week until they could determine whether or not there was a reason to worry. Luckily, it was my senior years and I had bulked up on tough courses like photography. That is why I have all of these wonderful black and white, thirty-five millimeter photographs of that trip. I’m hoping that one of those fine folks who chased us through West Virginia, might remember that night, and would be willing to tell their side of the story. So there you go, a tale about choices and whether they really matter. Renounce all attachments, let go, and be free within The Way! Envisioning the new green revolution…the first time! 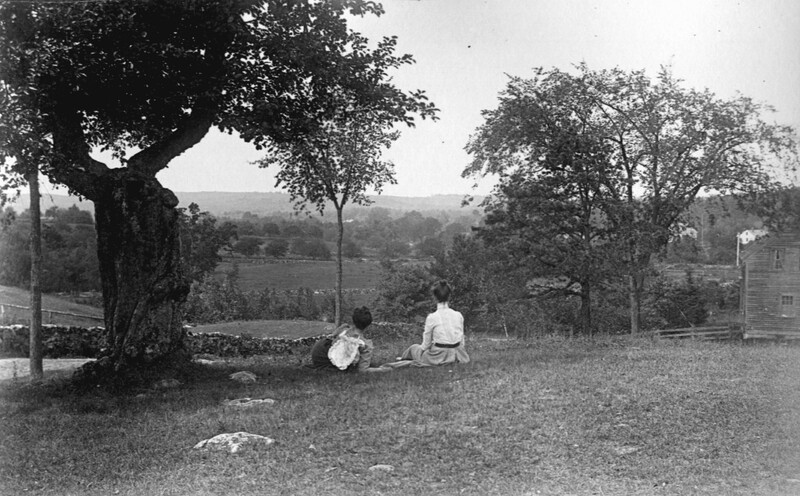 This photograph of Windham Center was taken from the Samuel Harris farm (Windham Village Green today) by William Austin Brooks between 1900 and 1902. He had rented Fairview cottage, on the shore of Cobbett’s Pond from the Harris family at the time. It is hard to imagine this beautiful scene where busy Route 111 is located today. The house to the right was owned by the Brown family for many years during the twentieth century but at the time it was known as Aunt Rufina’s place. When Lord Rumford was not chasing skirts, he put his brilliant mind to work solving practical problems in the world. This was a common attribute of many of the settlers of America in the 18th century and brings to mind other “Renaissance men” such as Benjamin Franklin and Thomas Jefferson. If you have lived in New England for awhile, you have probably heard of the “Rumford” fireplace, but might not have understood why it was such an advance in woodburning technology. 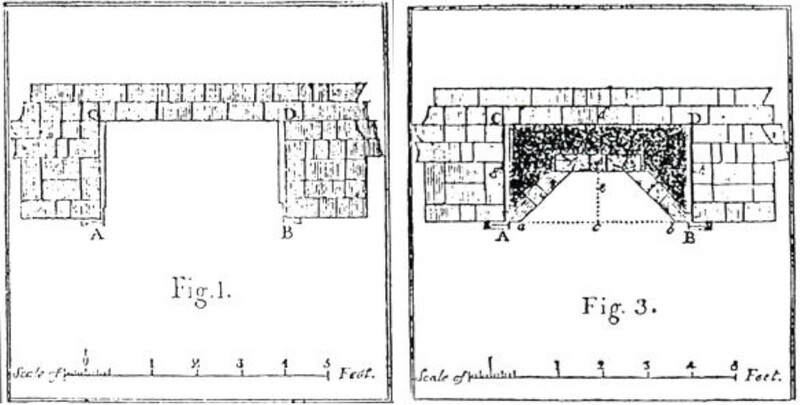 A plan of a traditional fireplace next to the Rumford design. 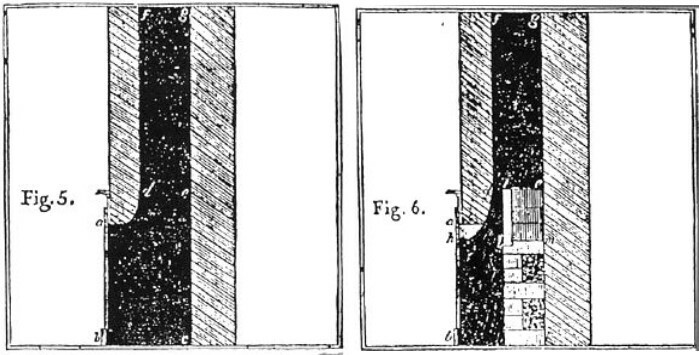 A cross section of a traditional fireplace next to the Rumford design.